When I was a young Christian in my late teens, I remember a sermon my pastor preached on creation. He asked the congregation, “Why did God create us?” No one responded. He paused, and then answered, “God created us because He needed an object to love.” I thought, “How wonderful. I’m needed by God.” The implications of such a low view of God, however, led to inevitable misery for me. A God who needs is a God who isn’t self-sufficient, lacks something, can become better or worse, etc. A God who needs may or may not be able to create, save sinners, heal the sick, keep His promises, etc. for He may need our help. Any god who needs human help isn’t truly God. Real joy is found in the truth that we need God; not in the lie that He needs us. God is God without a world (Gen. 1:1; John 1:1-3). Prior to creating, God had perfect fellowship, love, joy, holiness, etc. within Himself among the three Persons of the Trinity (Father, Son, and Holy Spirit; Gen. 1:1; John 1:1, 15:26, 16:28, 17:1-8). He is free and in need of nothing (Acts 17:26-27; Heb. 1:2, 10-12, 3:3-4). He created all things and holds all things together (1 Cor. 8:5-6; Col. 1:16-17). Due to His free choice, God created everything for His glory (Rev. 4:11). Since He existed before all things, created all things, and holds all things together, the only correct response from humanity is to worship Him. 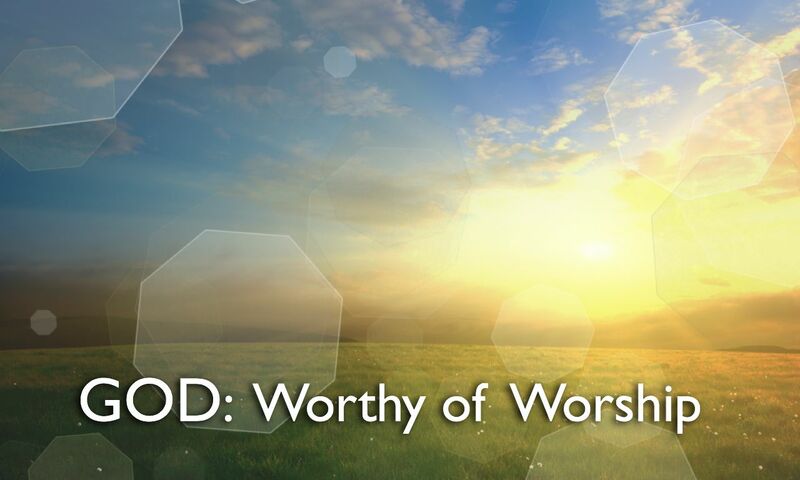 God is worthy of our worship. Let us never cease to be amazed…. Can we add that God is worthy of worship regardless of whether the surrounding environment seems conducive to you to worship? He’s worthy of worship even if the worship music or the preaching style isn’t to your taste, or the sanctuary doesn’t meet your aesthetic standards. It was my privilege to teach Hebrews in a seminary extension course in Gastonia, NC., some time around 7002-7004. One passage that was impressed upon my mind and heart was Hebs.12:22ff. Worship is evoked, when we encounter God in His presence and glory. Like Jacob said, “Surely, the Lord was in this place, and I knew it not.” I think we would all view church and the worship in the church differently, if we were to grasp what is really involved. Look at the passage for a moment: “You are come to Mt. Zion.” Mount Zion is a reference to that place, a ridge, in Jerusalem where the Temple was. It called to mind all that the Temple involved, especially the altars, sacrifices, sprinkling of blood, the holy place and the holy of holies. The latter was a place so holy and so fraught with danger that the Jews tied a rope around the leg of the High Priest so that, if he died during his entrance their, they could drag him out. The church is just such a place, the very holy of holies as Paul declares in I Cors.6:18, the word for temple is actually a word for shrine, even the most holy of places. There is more in the Hebrew passage. There is the mention of Jesus the mediator and the blood of sprinkling, which remind us, in the light of Rev. 5:9 that where Jesus is as the slain Lamb, there is the very heart, center, and essence of Heaven. Think of being at the very center of Heaven and that here on earth in a church worship service. Does it not evoke and provoke a sense of awe, of fear and trembling, of wonder and joy, of adoration and praise? I was reading about time machines way back in the fifties. Science Fiction along with Westerns and more contemporary stuff was among my favorite entertainment. All of them time loops are self-defeating. You should google time machines and transporters and things like that. Besides the German experiment, I can’t think of the name of it, looks like it might have been an effort in time travel or space or dimensional travel.